MCC Magazine, Vol. XXXVI, No. 2, March 1967, pp. 47-49. About 200,000 years ago people of the Old Stone Age (Lower Paleolithic Culture) roamed about Tambaram. They fashioned rough stone implements out of quartzite and used them for hunting and skinning wild animals. These implements or artefacts are called ' the hand axes of Madras industry.' 3 The primitive men did not know the use of wooden handles for their stone axe-heads but used their hands instead. The first hand axe was picked up at Pallavaram over a century ago, and within the campus, several artefacts have been picked up by students4 and members of staff. 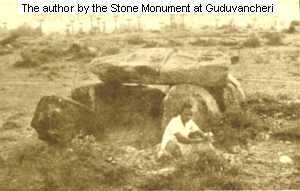 Around 300 B.C., there were people of the Iron Age living in Tambaram area and they built their burial monuments in the form of dolmens and stone circles which are called Megaliths5 (big stones). 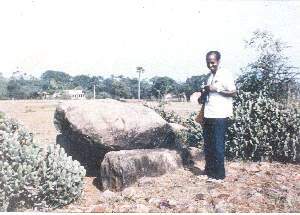 Fine examples of such Megalithic Monuments can be seen about 100 metres east of the Great Southern Trunk Road near Guduvancheri railway station. One of the main problems of Indian archaeology is to find out who these Megalithic people were and where they came from. There is considerable difference of opinion among scholars as to whether Asoka's empire included thondai nadu, but there is no direct evidence to support this view. It is believed that the area was once occupied by the Kurumbas and the jungle areas were cleared for agriculture by Karikaalan and also by Thondaimann Ilamthirayan whose praises are sung in Perumpaanaatrupadai. 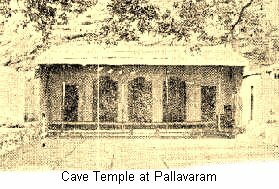 The historic period proper begins with the Pallava kings and the earliest of their stone inscriptions is found in Pallavaram (Pallava puram) in a cave temple excavated by Mahendravarman I (600-630 A.D.). He was the first king in Tamilnad to excavate a temple in solid rock and similar cave temples are found in Mahabalipuram and elsewhere. The Pallavaram cave temple is now being used as a Moslem place of worship and the inscriptions giving the different titles of the king have been completely covered. Pulikesin II was the famous Rasthtrakuta king who defeated both Harsha of North India and Mahendra Pallavan. Narasimhavarman I who succeeded Mahendravarman I waged battles against Pulekesin and defeated him at Manimangalam6 which is only about 8 kms. west of Tambaram. This is mentioned in the Kuram copper plate inscription,7 the Tamil part of which is written in a script which is a mixture of Pallava Grantha and Tamil. Near Guduvancheri there is now a small village called Nandivararam (Nandi puram) which must have been named after the Pallava king Nandivarman whose praises are sung in Nandi kalambakam. Tambaram region must have been a flourishing country during the later Chola period which lasted for about 250 years after 1000 A.D. Tamil inscriptions of the Cholas are found in Manimangalam, Tiruneermalai, Tirusoolam and Kunrathoor. At Kunrathoor, the birth-place of Sekkilar, one Kaasyappa was the local doctor (Vaidya) 8 and some lands were set apart for his services. Inscriptions at Tiruneermalai refer to certain merchants from Pammal showing that this village near Pallavaram existed even then. Inscriptions at Manimangalam of Rajadhiraja I (1018-1054) give us details of a war with Ceylonese kings. Rajadhiraja defeated one Veerasalaamaygan9 of Ceylon, carried away his wife and sister and cut off the nose of his mother. This sort of barbaric behaviour seems to have been very common in those days even though the kings were supposed to follow Manu's Dharma Sastra. Stories of such mutilations and abductions have been handed down to us in epics like the Ramayana. The inscriptions of Kulothunga I (1070-1120), the hero of Kalingathu parani, are found at Tirusoolam near Pallavaram and of the inscriptions of Kulothunga III there are several in this area. The country was divided and subdivided into smaller units and Taampuram10 was located in Surattur nadhu, a subdivision of Puliyur kottam in Jeyankonda sola mandalam. The temples priests lived in villages called Chadurvedimangalam and there a lottery system (kudavolai) was used to select the village committee (sabhai). Some of the villages were renamed after the king but in most cases the earlier names prevailed. Immediately after the Cholas, it was the Pandyas of Madurai who held sway over thondai nadu and the Pandya inscriptions are found at Kunrathoor, Tirusoolam and Tiruneermalai. Temple building activity which started during the Chola period continued during the Vijayanagar period in this area and inscriptions of the Vijayanagar kings of the 14th to the 17th centuries are found here. This brings us to the modern period. The Tambaram area is rich in inscriptions of different languages and scripts and there are temples and sculptures which are hundreds of years old. There must be several Stone Age implements ready to be picked up and those who join the treasure hunt will find it quite rewarding. 1 J. S. Gamble, Flora of the Presidency of Madras (Calcutta, 1957), p. 33. 2 Nandikkalambakam (Tamil), (Madras, 1961), p. 66. 3 V. D. Krishnaswami, ' Stone Age India ', Ancient India (1947). 4 The largest hand axe was picked up by Mitran Devanesen when he was a student here in the Pre-University class. 5 N. R. Banerjee, ' Megalithic problem of Chinglepet district in the light of the recent exploration', Ancient India, (1956), pp. 22-32. 6 V. Rangacharya, Inscriptions of the Madras Presidency, Vol. i (Madras, 1919), p. 411. 7 E. Hultzsch, South Indian Inscriptions, Vol. I (Madras, 1890), p. 152. 8 K. V. Raman, The Early History of the Madras Region (Madras,1957), p. 184. 9 E. Hultzsch, South Indian Inscriptions, Vol. 3, Part I (Madras, 1899), p. 53. 10 Annual Report of Epigraphy (1932-33), p. 75.